Happy Thanksgiving Eve, everyone! Today we have a brand new challenge over on the Simon Says Stamp Wednesday Challenge blog and it is a great one for this holiday weekend! It's ANYTHING GOES time! The Design Team is featuring Altenew products this week. You don't have to use them to play along, but if you have some we'd love to see what you do with them! 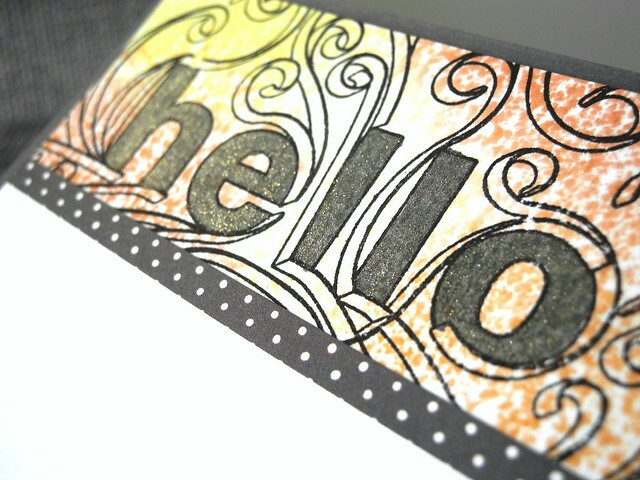 I pulled out the Altenew Quilled Elegance stamp set along with a set of Altenew dye inks to create my card for today. I love that these inks come in cubes so I can get lots of colors without a lot of cost! YAY! I did a little smooshing on watercolor paper for the color and then added the image in black ink over the smooshed ink. I colored in the letters using the Wink of Stella black brush. This has gold glitter in it, making it a perfect match for these warm color tones. I love how that Wink of Stella adds so much sparkle to the finished design! A simple strip of paper form the Lawn Fawn Let's Polka 6x6 paper pad finishes off the card. Now it's YOUR turn! Create something NEW and fabulous and link it up over on the Simon Says Stamp Wednesday Challenge Blog for your chance to win a $50 Gift Voucher to the Simon Says Stamp store! Woot! Woot! Oh!! I love the styling around this!! So artsy and FUN! A fabulous care Jennifer, a great Quilled Elegant stamp with gorgeous colour background. I love your design - that has given me an idea I wish to 'create' !! What a warm and wonderful card! I love these colors and especially how you colored in the letters! I've got to play with my Wink of Stella colors more!!! Thanks so much for sharing and inspiring! hey Jingle! fun card, I adore the heading and the sweet polka dots! hope you have a FAB weekend! Beautiful - way to let that image shine!